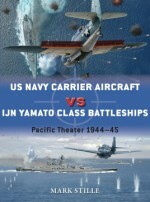 Employing full-colour artwork, carefully selected archive photographs, and expert analysis, former US Navy Commander Mark E. Stille examines the two head-to-head clashes between the battleships deployed by the United States and Japan in the struggle for control of the Pacific during World War II. Mark E. Stille (Commander, United States Navy, retired) received his BA in History from the University of Maryland and also holds an MA from the Naval War College. He has worked in the intelligence community for 35 years including tours on the faculty of the Naval War College, on the Joint Staff and on US Navy ships. Currently a senior analyst working in the Washington DC area, he is the author of numerous Osprey titles, focusing on naval history in the Pacific.Born in Malaya in 1949, Alan Gilliland spent 18 years as the graphics editor of The Daily Telegraph, winning 19 awards in that time. He now writes, illustrates, and publishes fiction (www.ravensquill.com), as well as illustrating for a variety of publishers (alangillilandillustration.blogspot.com).Paul Wright has painted ships of all kinds for most of his career, specializing in steel and steam warships from the late 19th century to the present day. A Member of the Royal Society of Marine Artists, Paul lives and works in Surrey.